So, you may have heard a little story this week about five feet of snow getting dumped on Buffalo? The Bills were scheduled to host the New York Jets this weekend to close out their annual home-and-home divisional rivalry, but the weather’s turn for the worse (c’mon guys, five feet!) 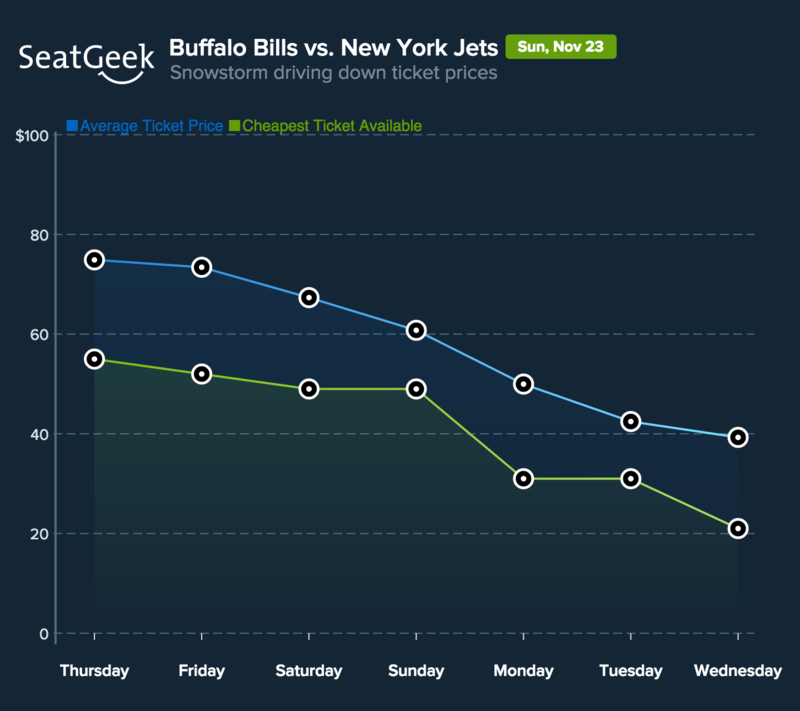 has sent ticket prices for the Bills-Jets rematch plummeting faster than a thermometer feeling the lake effect. The Bills are hoping to end their two-game losing streak, but it’s going to be awfully tough to repeat their dominant performance over the J-E-T-S when they’ve been snowed in and unable to practice as a team all week. Not only is this a testament to the good people of Western New York overcoming the elements; it’s also a case study in a professional football team’s ability to prepare for a game exclusively via web conferencing all week. 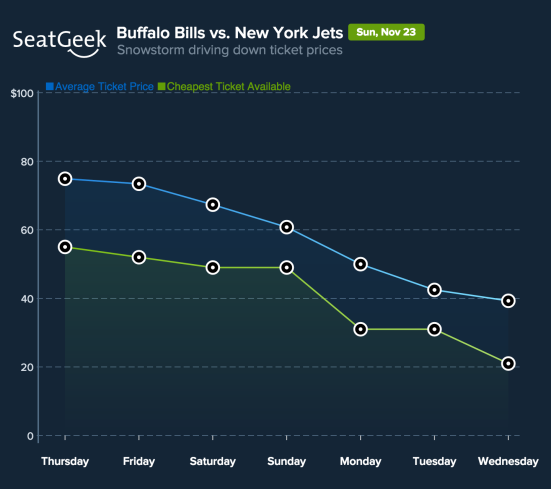 Bills-Jets is now the cheapest NFL game this weekend at an average price of $39 per ticket. 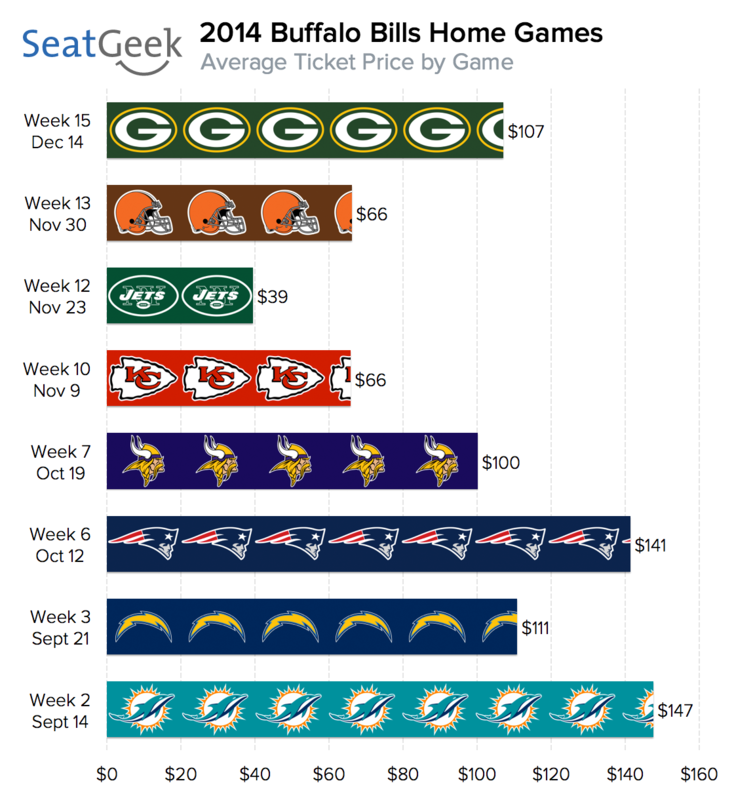 In fact, that $80 third-row ticket behind the Bills bench is less expensive than the cheapest ticket available in the upper deck for 10 of the 14 other NFL games this week! The NFL has decided to relocate the game, but it’s still unclear exactly how tickets that have already been sold will convert for a new venue. It’s important to contextualize the remarkably cheap tickets for this game with the fact that the Bills have been a relatively hot ticket this year. Bills tickets have been more expensive this year than in any season since 2010, with seats at Ralph Wilson Stadium reselling for an average of $94 this season, up 16% from $81 in 2013. This will be the cheapest Bills home game in at least the past two seasons, depending on how much further prices fall from here. Back in 2012, the Bills hosted the lowly Jacksonville Jaguars, and the average price mid-week before that game was $31. The cheapest seats for Bills-Jets start at $21, down more than 60% from a starting price of $55 this time last week.